Strontium Market size was over USD 400 million in 2017 and is projected to expand at over 6% CAGR over the forecast timeframe. Increasing use of fireworks and other pyrotechnics during festivals and other entertainment sectors such as in concerts, movies, sports events, etc. will subsequently boost the strontium market size by 2025. Strontium is a highly reactive metallic element, occurring naturally and mostly mined from celestine and strontianite minerals. Natural strontium is not hazardous to health whereas on the other hand synthetic strontium is radioactive in nature. The mineral also finds an extensive application in electrical & electronics industry, where it is broadly used for making cathode ray tubes (CRT) used in television sets. Previously, 75% of the strontium production was consumed in making CRT tubes to eliminate the x-ray emission from TV sets. But this application is declining due to innovations in modern display methods. Presently, the maximum product application is registered by pyrotechnic industry owing to the deep red color provided by strontium carbonate in fireworks and flares. Moreover, innovation of environment friendly flares will expand the product demand in the expected timeframe. For instance, researchers from the U.S. Army Research Laboratory and the Ludwig Maximilian University in Munich, Germany have developed an environmentally-friendly red light flare popular in fireworks displays and for soldiers who use them in training and battlefield operations as signaling devices. Similar, product innovations will positively propel the strontium market size in the projected timespan. Also, strontium chloride is vastly used in toothpastes to reduce pain in sensitive teeth. It is the most common form of strontium found in dietary supplements. The product use in the dental industry to prepare tooth sensitive paste is a growing trend and shall subsequently boost business growth by 2025. For instance, Q BioMed Inc., a commercial biotechnology acceleration development company, and BioNucleonics, licensor of strontium chloride, announced the submission of supplemental regulatory filing to the FDA for approval of a new manufacturing facility on August 2018. Once cleared by the FDA, the facility will be permitted to manufacture strontium chloride for dental and medical applications, directly fueling the strontium industry share during the forecast timeframe. 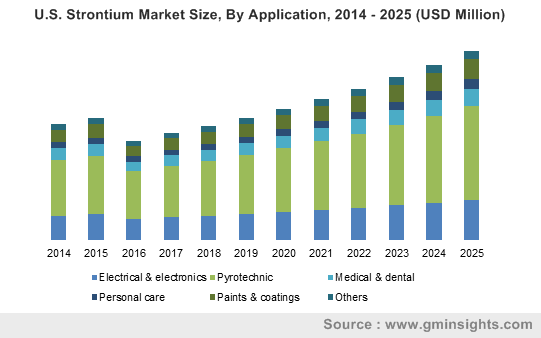 Introduction of strontium ranelate may also bring new opportunities for the product market share in the medical and dental industry by 2025. This form of strontium is used in killing cancer cells and can increase bone formation and prevent bone loss when used in postmenopausal women with osteoporosis. It is also used for preventing tooth decay, which would generate copious opportunities for the strontium market size in the projected time period. The reactive nature of the mineral and stringent government regulations for controlling mining emissions to improve the air quality is likely to hinder the strontium market share by 2025. The effect of laws to enforce the limited use of the product will certainly affect the strontium market size in the coming years. Moreover, synthetically formed strontium possesses radioactive properties that can be hazardous for human life. Based on the product type, the strontium market is classified into strontium carbonate, strontium sulfate, strontium nitrate, and few other strontium compounds. Strontium carbonate is expected to generate the maximum revenue of over USD 150 million in 2017. It is used as an oxidizer and colorant in fireworks. Oxidizers are one of the raw materials used in fireworks, which are the major contributors toward increasing pollution. The oxidizers feature high levels of oxygen and thus are used to set fire to different mixtures of fireworks. The growing electronics market is also expected to boost the demand for strontium carbonate since it is used widely in making cathode ray tubes for television sets. The product also has widespread usage in medical application for treating osteoporosis and in paints and coatings industry for its property to provide glossy shine and essence to the solutions, that will positively swell the overall strontium market size by 2025. According to applications the product market is categorized into electrical & electronics, pyrotechnic, medical & dental, personal care, paints & coatings, and others. Strontium market for pyrotechnic is expected to grow at a CAGR over 6.5% in the forecast period. Strontium is commonly used as an inexpensive colorant in fireworks. The product and its salts help to emit red color in the flame. Strontium carbonate is generally preferred instead of any other compound owing to its low cost and the fact that it is not hygroscopic. Its ability to neutralize acid is also very helpful in pyrotechnics. Growing demand for firecrackers and pyrotechnic activities during concerts, festivals or any sort of celebrations will inevitably augment the strontium market size in the forecast period. Additionally, it is also widely used in making flares and flare guns that has its applications in defense industry globally. Asia Pacific is generating the maximum revenue over USD 150 million compared to any other region in 2017, driven by gradual rise in consumption of strontium and its compounds in electrical & electronics and pyrotechnic industries in countries including India and China. Asia Pacific is expected to be the largest strontium market owing to the presence of huge celestine mineral deposits in China. China registered the largest procurement of celestine in the world from its mines which was over 350 kilo tons in 2016. Moreover, increasing use of firecrackers in these countries on festive occasions is a prominent factor towards high regional product demand. In addition, China and India are major producer of fire crackers, which substantially contributes in the regional industry growth directly augmenting the strontium market size by the expected time span. Strontium market share is competitive due to the presence of various prominent industry share contributors i.e. Solvay, Sakai Chemical Industry Co., Ltd., BassTech International, Canteras Industriales Sl, Química del Estroncio, S.A., Joyieng Chemical Limited, Shenzhou Jiaxin Chemical Co., Ltd, Prochem Inc., Chemalloy Co. Inc. and NOAH Technologies Corporation. 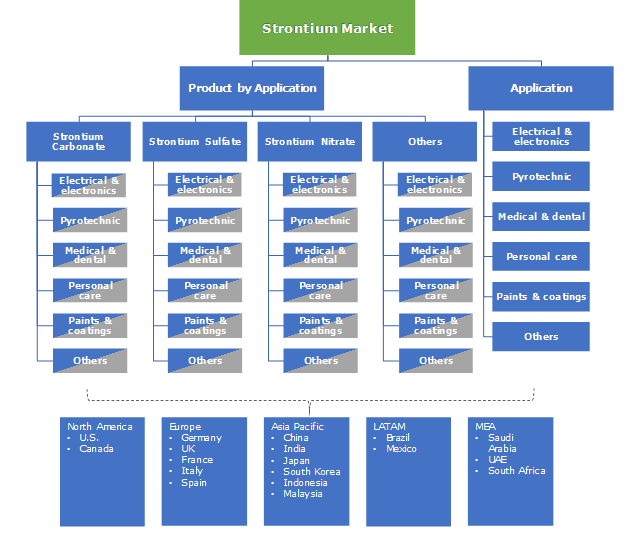 Key strontium market players are focusing on strategic partnerships and new ventures for expanding and improving their product portfolio with new and innovative products to gain competitive edge over other manufacturers. For instance in 2007, Solvay joined its business units with CPC Barium Strontium GmbH to improve their strontium compound grades and enhance their product range. Strontium is a silvery, soft alkali metal that has the tendency to burn in air and react with water. It is amongst the most abundant elements found in the earth’s crust and is attained from two mineral sources namely celestine and strontianite. It is widely used in electronics industry due to its exceptional thermodynamic and mechanical properties. Strontium carbonate is witnessing a fast growing industry share due to its extensive applications in pyrotechnic, electronics industry, medical activities etc. Asia Pacific and North America are the major regions that witnessed a significant demand owing to their vast population and rising industrialization.